Speakeasies are becoming increasingly common in Guangzhou. Some may even say they are the bar-type of choice for folks opening new establishments in the city. But with Whispers, located above Kung Food restaurant in Panyu District, veteran Guangzhou expat Rob Turnbull is looking to buck the trend. Sure, the bar slash lounge hosts a secret entrance – an important speakeasy trait – but at Whispers you won’t find vodka, rum or tequila, nor will you find cocktails bearing the aforementioned liquors. No, Whispers is all about whisk(e)y.
Celebrated Japanese author Haruki Murakami once said, “Whisky, like a beautiful woman, demands appreciation. You gaze first, then it’s time to drink.” Mr. Murakami would find lots to gaze at inside Whispers, where Turnbull and his staff tend to a collection of 88 whiskies – from Scotch and Irish whiskey to bourbon and Japanese varieties. The cozy interior of Whispers was designed, constructed and detailed by Turnbull and features leather furniture that could have been borrowed from Ron Burgundy’s bachelor pad. Behind the bar, three shelves divide the lounge’s selection of whiskeys and whiskys based on price: RMB60 per 50-milimeter dram from bottles on the bottom shelf, RMB80 per dram from the middle-shelf bottles and RMB100 and up for top-shelf pours. On our visit, we sampled the Bowmore 12 (RMB60), a single malt scotch whisky with a delicate and intriguing peat-smoke taste. 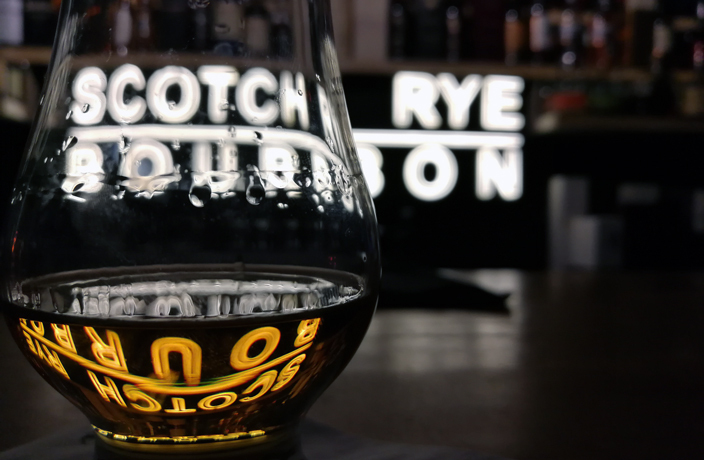 Smooth from nose to finish, we found this Scotch an accessible starting point for Islay-style experimentation. Among Turnbull’s favorites is the Nikka Coffey Grain (RMB80), a smooth Japanese whisky that offers the curious tippler a pleasant, sweet finish. While anyone can rock up to Whispers and get their (sophisticated) ‘draaank’ on, those holding a membership (RMB500 with a RMB300 bar credit) enjoy a range of perks – from drink and bottle discounts to tasting event invites and a personal whisk(e)y journal. Inquire with bar staff on your next visit to find out how you can join the club. Tues-Sun, 7pm-2.30am; see listing for Whispers. While you may or may not have been privy to this unique strip, Baiyun’s ‘Korean Food Street’ is an area to which you’ve got to pay a visit. We walk you through our top three favorite bars that we've reviewed in the past six months. If you manage to track down this whisky and cigar lounge, you'll find yourself transported to one of Guangzhou's most authentic speakeasies. It may look like a quirky one-off, but in fact, Beerbox has three separate locations throughout Haizhu District. This new Panyu cafe boasts a vintage Ford automobile: a gimmicky prop for portraits. Tap House is the best and perhaps only Western-style, craft beer-serving pub in Nanshan. Ready to break out of the Zhujiang New Town dining bubble? Try Concerto Bistro.